Shoot from the hip. Failing to consider relevant information. Yesterday’s news. Basing decisions on outdated information. Define the problem. Losing sight of the key objectives. Learn your lesson. Failing to apply lessons learned from previous experiences. To-do versus must-do. Addressing low-priority activities just to check off items. Emotions get the better of you. Making important decisions in a poor frame of mind. False assumptions. Failing to consider personal bias or inexperience. Frame of reference. Making decisions in a vacuum. Analysis paralysis. Waiting for every piece of information before making a decision. Garbage in. Relying on sources with poor credibility. Fear the worst. Avoiding a decision out of fear of making a mistake. Band-aid solutions. Making a quick fix rather than addressing the root cause. Ego. Failing to request or consider input from people in the know. Take the good with the bad. Failing to view the downside as well as the upside. Jump the gun. Selecting the first option rather than exploring alternatives. Plunging in. Rushing to judgment without understanding the ramifications. Piecemeal. Optimizing a single component at the expense of the whole. Fixed focus. Failing to account for a changing landscape. It’s all in the details. Giving inadequate thought to implementation. Silver bullet. Doing what’s easy rather than what’s best. Overly complex. Making implementation overly complicated. Out of sight. Failing to consider opportunity costs. Deer in headlights. Postponing decisions until tomorrow. Cover your behind. Making decisions merely to justify previous actions. Neglecting your values. Selling your soul rather than doing what’s right. Forest and trees. Getting caught up in the details while missing the big picture. Looking over your shoulder. Spending more time second-guessing decisions than moving forward. Bury your head in the sand. Avoiding reality. 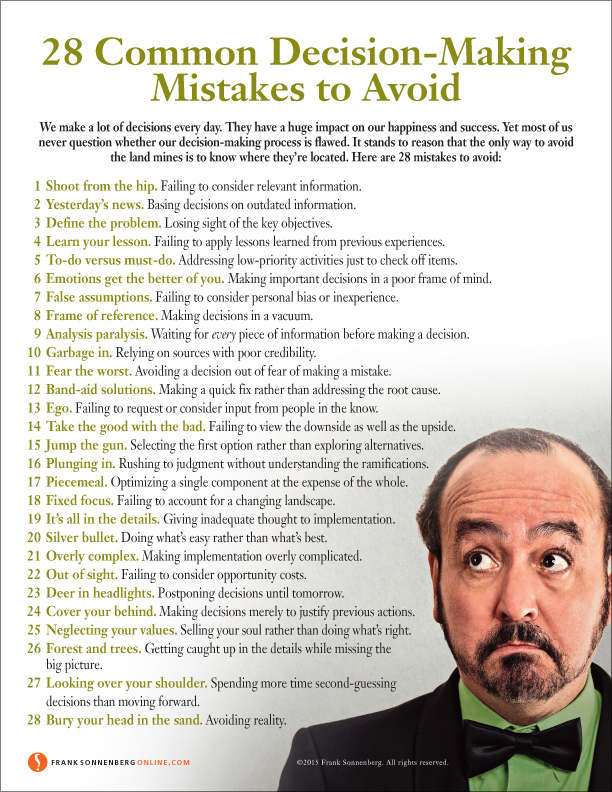 Do Any of These Decision-Making Mistakes Sound Familiar? I have a problem with the “want to do” vs “need to do” decisions. I need to do X, but want to do Y. I also “fear the worst”. I hate making mistakes. I hear what you’re saying, Dan. When you have a moment, check out my post, “Dilemma: Have To vs. Want- to” I think it addresses your point. Here’s the link for your convenience.